Oh yes! On Saturday I got to touch the same plate that Joe Carter crossed when he hit the World Series winning homerun in 1993. It was an enormous rush of shear ectasy and elation, as I touched the ledgendary plate. For a minute, I relived that homerun all over again. It truly was one of the greatest feelings I could ever have. In this picture, you are witnessing one of the greatest moments in my history, along with Canadian Baseball History. This is a good picture my girlfriend caught. I’m saying, “Can I touch it?” to the tour guide accompaning us through the Hall. I even have my hand out shaking as I say it – imagining the beautiful moment that my hand was about to encounter. Phew, what a day!!! 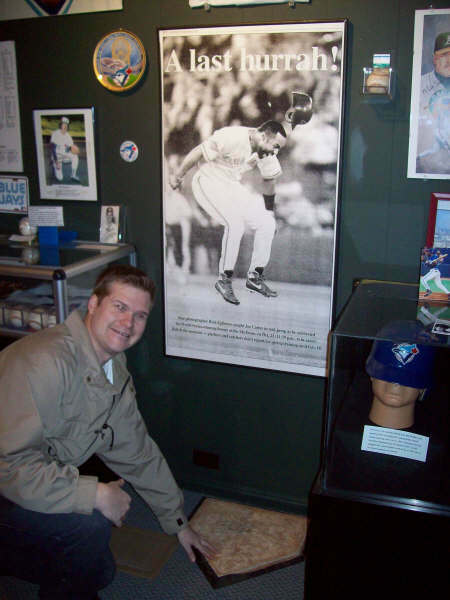 The Canadian Baseball Hall of Fame houses many interesting pieces of baseball history in Canada. 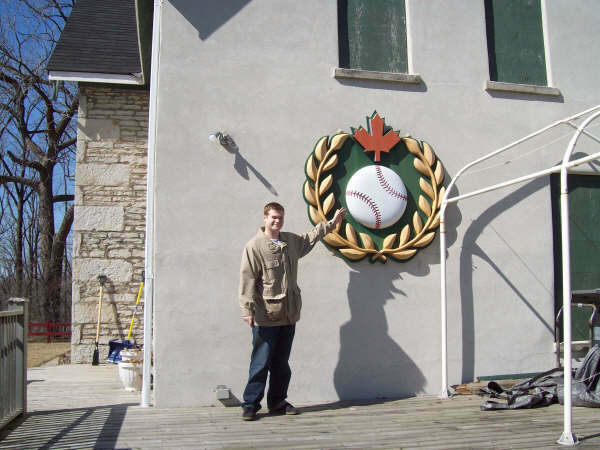 The outside of the Canadian Baseball Hall of Fame is similar to a house in the town of St. Marys. This adds to the nostalgia and historic atomosphere of the building. Here I am in the actual Hall. 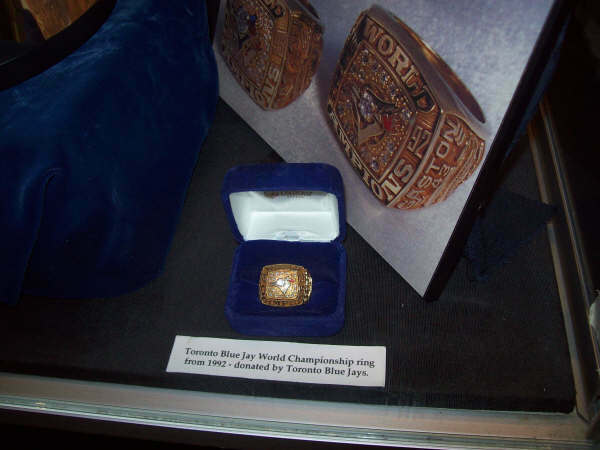 Not only are Canadians recognized here, but others with contributions to Canadians Baseball History – such as, Joe Carter, current Blue Jay manager Cito Gaston, Tony Fernandez and Cooperstown Hall of Fame catcher Gary Carter, to name a few. “Fergie was the man!” from the words of my tour guide. 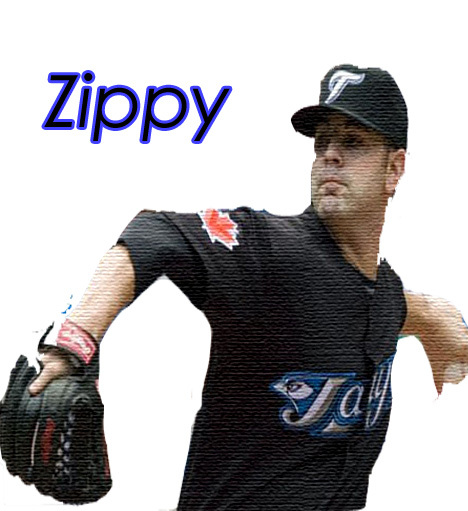 He is a Canadian Baseball icon, and an excellent pitcher in his time. Fergie Jenkins was the prototypical finess pitcher. He won 20 games seven different times, along won the Cy Young in 1971. He won 20 games in six straight years from 1967-1972!! Yes indeed! 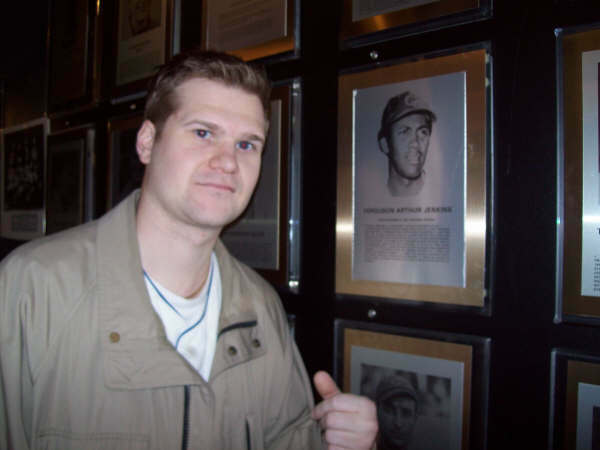 He was the man, and has his own section in the Canadian Baseball Hall! 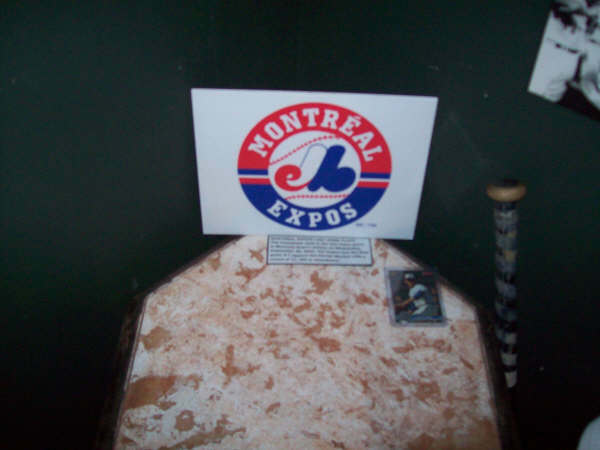 Home plate taken away from the last game at Olympic Stadium in Montreal was a sad thing to look at. The Expos have a large feature exhibit in the Hall. 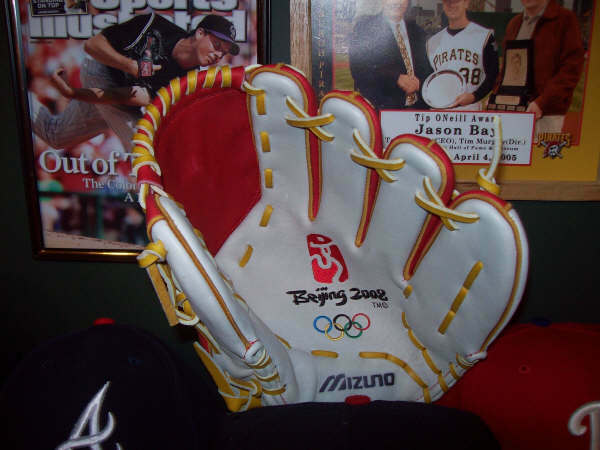 Equally as sad was this glove from the 2008 Summer Olympics in Beijing. Knowing that baseball may be taken out of the Olympics is what made looking at this a difficult thing for me. I have loved cheering for Canada in the Olympics, where hometown stars like Stubby Clapp and Peter Orr emerged. A great number of the international competitions that Canada competed in are featured here in this exhibit. My girlfriend, who was taking the pictures, saw this as one of her favorite exhibits. 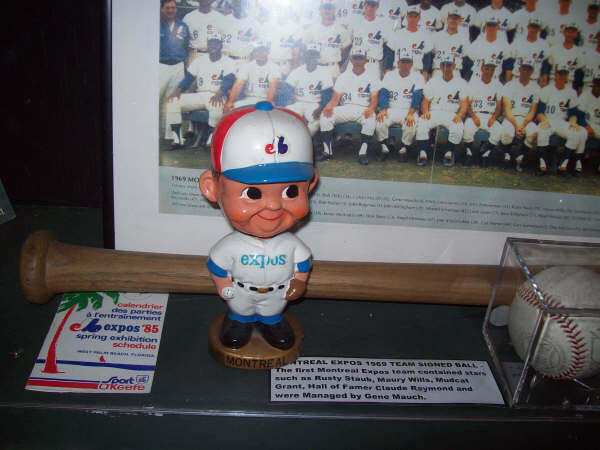 It is chubby Expo bobblehead along with the Expos display. The cuteness of this bobblehead lives on, even after the fallen Expos franchise. 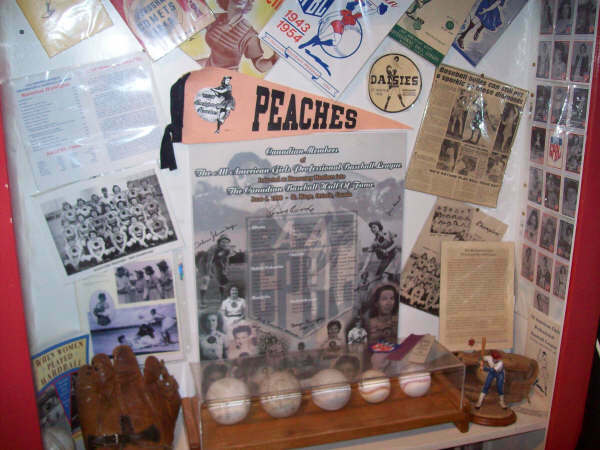 Among the many great displays, was a number of pieces from the short-lived 1940’s women’s league that was featured in the movie, “A League of Their Own.” A large percentage of the players in that league were actually recruited from Canada, many might not know. 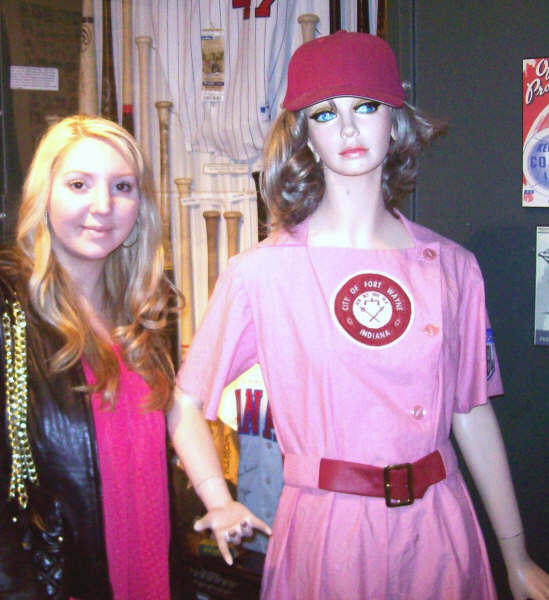 My girlfriend loved the pink uniform. This exhibit was very well done. On the right: Tip O’Neil is a ledgendary Canadian member of the CBHOF. He played in late 1800’s and put up astronomical numbers. The Tip O’Neil Award is given to the most outstanding Canadian baseball player every year. 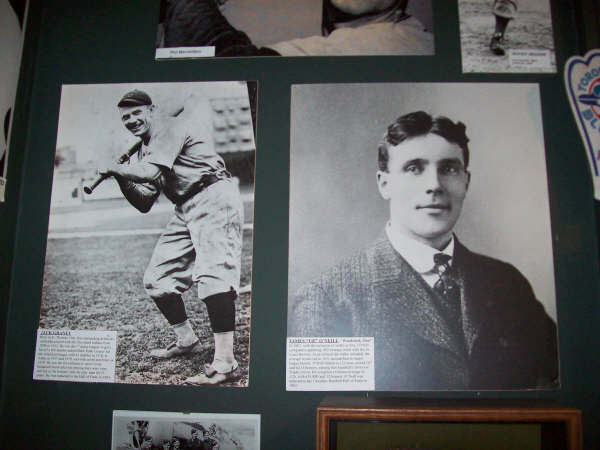 On the left: Jack Graney was the first major league player to appear in a game with a number on his uniform. He later became the first major league player to become a broadcastor. The Jack Graney award is presented periodically to journalists deemed to have made notable contributions to promoting baseball in Canada. Member of the Canadian Baseball Hall of Fame and one of the greatest Blue Jays to ever put on the uniform has his own section here. 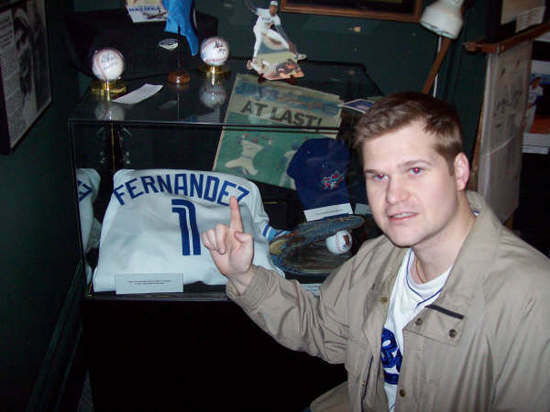 Tony Fernandez is the all-time Jays leader in hits, he has come back to play for the Jays three different times and has always been an exciting fan favorite. With his looping, but deadly accurate sidearm throws from shortstop, #1 Tony was definately one of my favorites. I got a little excited over this display. Here is some Blue Jay Bling, Bling!!! Hope that you weren’t blinded. Don’t worry, I will get our healthcare system will cover it. 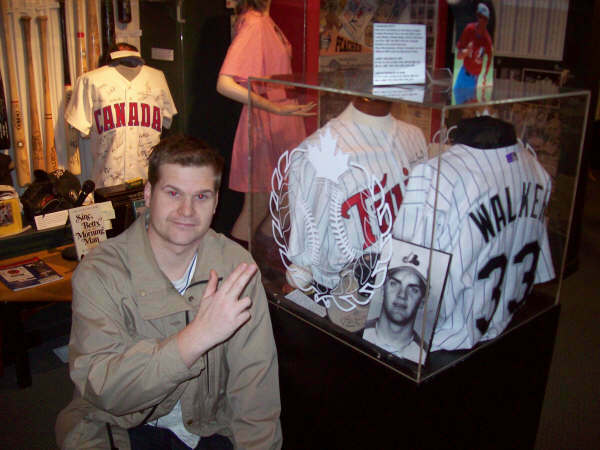 Larry Walker and Justin Morneau are the only two Canadians to win MVP awards. They are honoured here in this section. More current Canadian players are recognized here. There is a lot of neat Justin Morneau stuff, like the first bat he used in the majors, a Canadian Cooper made bat FYI. 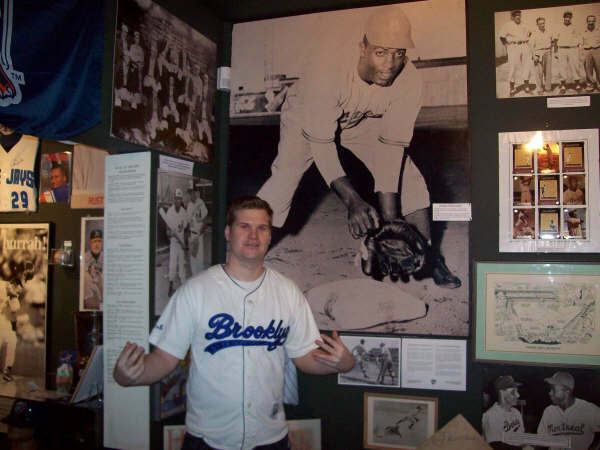 I wore my replica Brooklyn Dodgers jersey here because I knew that they had a great exhibit for Jackie Robinson. Like I mentioned before, Jackie played his first pro game in Montreal. 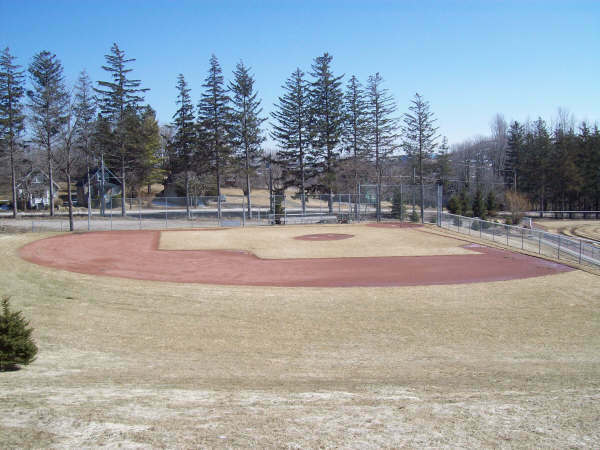 The Canadian Baseball Hall of Fame in St. Marys, Ontario also hosts a number of minor baseball tournaments, and other games of all kind. They have a MLB sized field with lights, and beside one field, are donated seats from the old Exhibition Stadium in Toronto. I sat in a couple, and it brought back memories from when I was a kid. We topped off the day a the Hall of Fame, the best way I know how. With a portabello burger loaded with cheese, and a side of sweet potatoe fries from a restaurant called the Creamery in St. Marys. 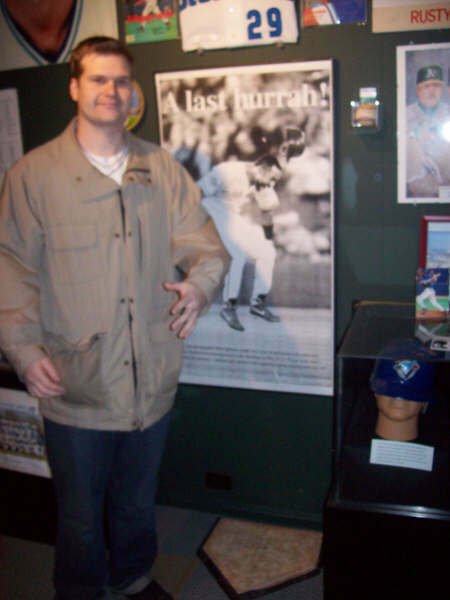 There is so much to see in the Canadian Baseball Hall of Fame, I could not possibly fit it all in one blog post. 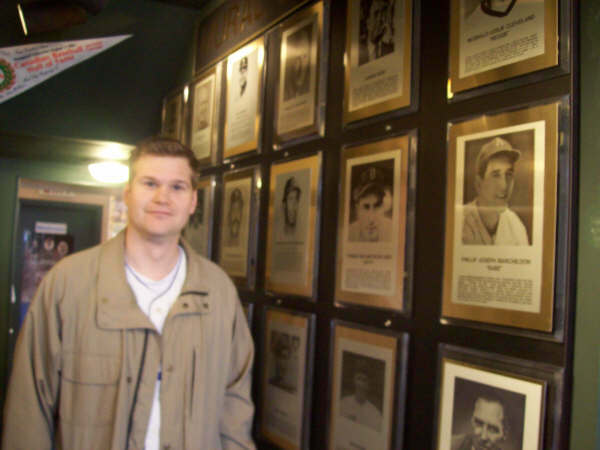 If you love baseball in Canada, general baseball history and want a really cool place to visit, St. Marys and the CBHOF provided me with that and more!! They do guided tours, and the people there have loads interesting of information. Anyway, this trip made my week, it made my month, it made my year!! Allow me to share with you some of my early childhood baseball cards. I found these hidden away somewhere. Many of my fondest memories of baseball, come from baseball cards actually. I traded them, I purchased them, I played with them and to this day I still hold onto them. I picked these particular cards because they are all great Blue Jays in my mind. 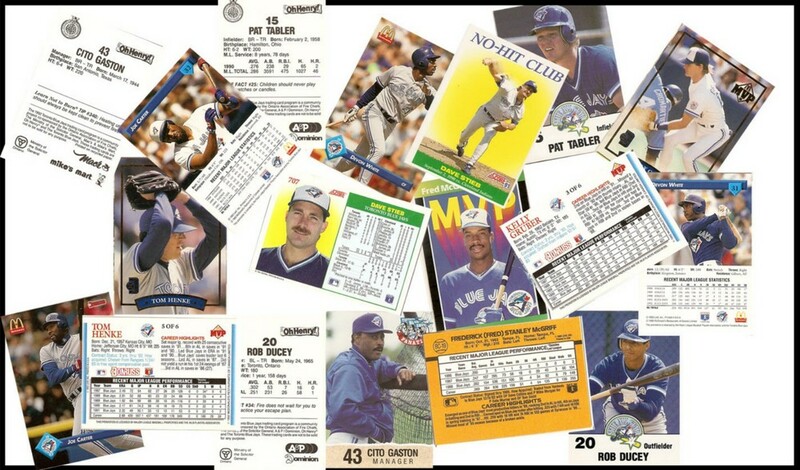 You’ll notice many of these cards have the McDonald’s ‘M’ on the corner, this is because they were purchased during a time when McDonald’s had a special promotion for the Jays World Series wins in the early 90’s. Not that it was the healthiest thing to do, but I urged my parents to take me McDonald’s pretty much everyday when those cards were in distribution. McDonald’s always gets you as a kid, it is almost unavoidable. Some of the others are government of Ontario/A&P grocery cards, Topp baseball cards and Donruss I believe. I think we got the A&P cards for free with a large grocery purchase. What an idea! I wish more places gave you free ‘Blue Jay’ baseball cards, because I’d pretty much be there. 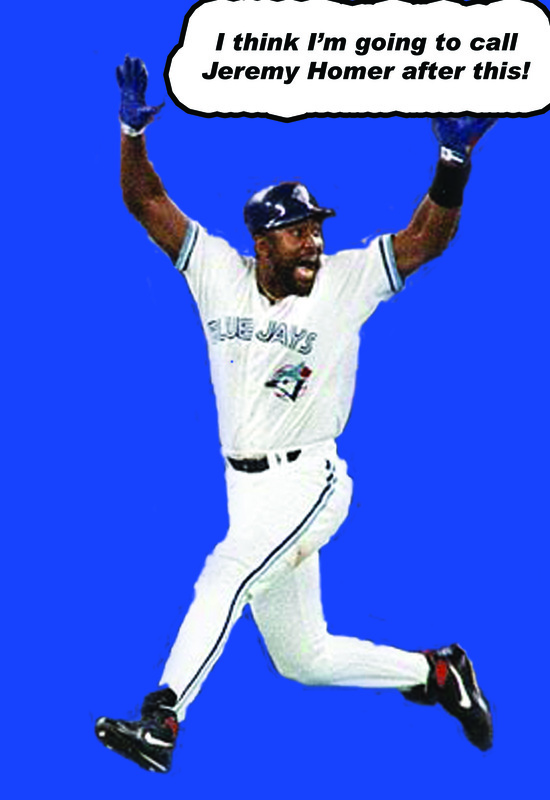 Most of you probably know Joe Carter, he hit the greatest homerun ever hit in Blue Jay history winning the ’93 World Series. You probably also recognize Fred ‘crimedog’ McGriff, he was an excellent Jay for many years untill he was traded for Carter. Jack Morris played with Jays for only two years, but had an awesome year in 1992 going 21-6. Kelly Gruber was a top notch third baseman that made one All-Star game for the Jays. I felt bad that he never got to hit in that game. The closest he came to action was the on-deck circle. He was also my little brother’s favorite player. A guy you probably wonder: ‘what is this guy doing on this cologue.’ Well, that is Rob Ducey. I decided to put him on because he is Canadian, and a Blue Jay. The guy was probably the only Canadian baseball player that I identified with in those years. He was a seldom used utility player, but did Canada proud regardless. Tom ‘the terminator’ Henke was my favorite Jay’s closer. The guy was dominant. I’ll always remember him pumping his fist after the Jays won a one-game playoff for the AL East pennet over the Orioles. He also looks amazing similar to my dad. Two great men I would add. Cito Gaston brought the Jays two World Series in the early 90’s. Were are hoping he translates that magic into the present day. Pat Tabler was with the Jays for one World Series in 1992. Today he does great color commentary for the Jays in my personal opinion. The guy flat out loves baseball – it is obvious. I personally enjoy hearing him on Blue Jay telecasts. Devon White is the ‘greatest center-fielder the Blue Jays have ever had.’ Vernon Wells has been a fine player for the team, but Devon White was so important to both the Jay’s World Series teams. His amazing catch in the 1992 World Series showed how the guy just ‘ate up’ numberous doubles and triples in the gap. Sorry Vernon, but you are going to have do some work for that label! Well, those are some of my cards. It was a lot of fun sharing them with you. I feel like a kid again.